WHAT IS OPEN EDUCATIONAL RESOURCES AND WHAT WILL IT DO? Open educational resources (OERS) is course material that is not copyrighted and freely available through the internet. Can this freely available material replace college textbooks? Consider for example a first course in college algebra. The concepts of algebra were developed thousands of years ago by the Babylonians, Egyptians and Greeks but the first modern treatment is traced to Al-Khwarizmi's, an Arab mathematician of the 9th century AD. In fact, the word algebra comes the title of his book published in 820 AD. While other important developments in algebra took place after Al-Khwarizmi, the material taught in college has not changed in many decades, even hundreds of years. Thus for courses like first year algebra, material-most of it now available on the internet - can be assembled and made available at low cost or no cost digitally to students. OERS should improve the flexibility and usefulness of course materials while driving down costs to students. A number of efforts are now underway nationally to pilot OERS in college and universities. For more information, the OER COMMONS is a good place to start. The cost of textbooks is a major complaint among college students nationwide. 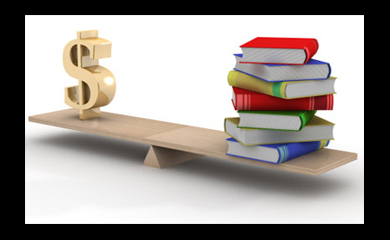 And for good reason – the College Board reported that during academic year 2011-2012 students on average spent $1213 on textbooks and related course materials at a private four-year college. The numbers at public institutions were similar with students spending $1,168. 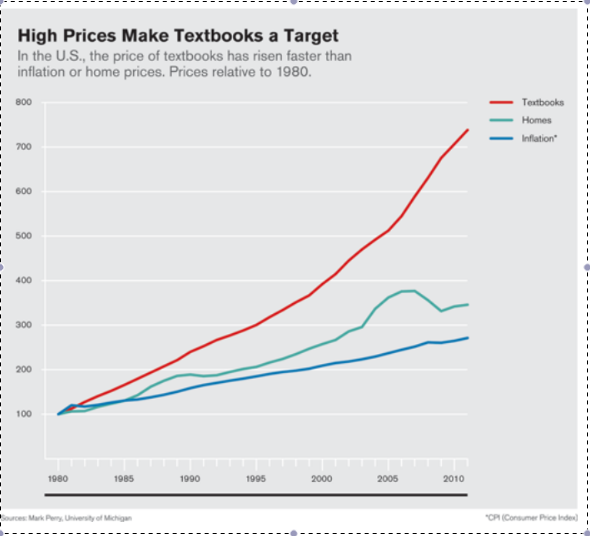 Textbook costs have reached these numbers because for decades their prices have risen rapidly, faster than inflation. The chart below from the January, 2012 issue of Technology Review shows the longterm trend; the red line showing the costs of college textbooks has gone up much faster since 1980 than home prices (green line) and overall inflation (blue line). What can and should be done? One opportunity is to develop inexpensive course materials from free information on the inter-net. More about that in my next post. At each time of the year the STCC campus has its own beauty. The picture above shows the campus green with a downtown office building and city bell tower just seen in the background. A closeup of this scene in the south-western direction is below. The view from campus toward the center of Springfield showing the City Bell Tower next to City Hall. Photo by Joan Thomas, January 2, 2012.